Why choose a slow juicer? There are two main types of juicer: centrifugal juicers and slow (or masticating) juicers. Centrifugal juicers work by shredding the fruits and vegetables and then spinning at a high speed to separate the pulp and juice. 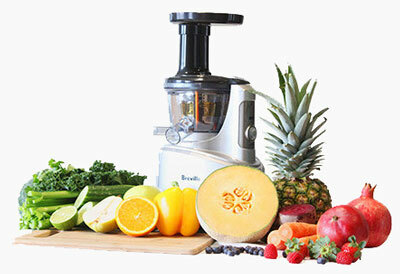 Slow or masticating juicers crush and grind the fruits and vegetables to extract the juice, then filter out the pulp. They’re called slow juicers because they don’t spin rapidly, not because it takes a long time to make juice; it only takes minutes to produce juice! Slow juicers produce drier pulp than centrifugal juicers, and extract more juice from leafy greens like kale. Some people have a preference from juice from a slow juicer, since it tends to be less frothy and more thick. The Juice Fountain Crush makes juicing and cleanup easy. 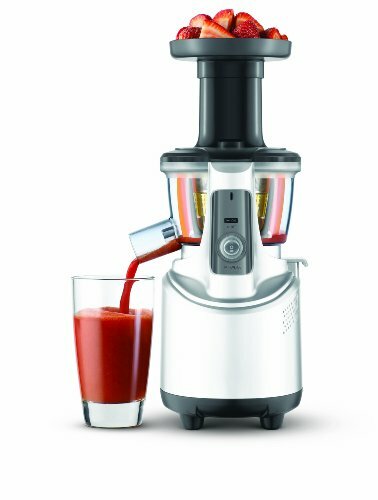 With features like a safe start system that requires all parts to be locked in before the juicer starts, reverse direction control, and an overload protection system that automatically stops the machine from operating when the load is too high, the Juice Fountain Crush makes operation safe and easy. To cleanup and flush out the system between making different kinds of juice without having to disassemble the entire machine, simply pour in 1-2 cups of water while the motor is running to flush the previous ingredients through. It comes with a cleaning brush to remove the pulp from the mesh basket, and the handle of the brush is the perfect size to clear out the pulp chute of the juicer. And, even though it’s powerful, the Juice Fountain Crush’s 240 watt motor runs quietly so your morning glass of juice won’t wake the rest of the household.